If you want the conventional and traditional pedometer that offers supreme quality and basic features, one of the best options is 3DTriSport Supreme Quality Walking 3D Pedometer with Clip and Strap. If you want to learn more about this product, continue reading. What Is 3DTriSport Supreme Quality Walking 3D Pedometer With Clip And Strap? 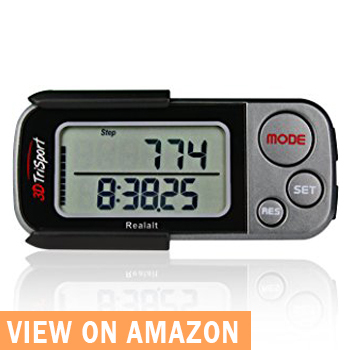 This pedometer is easy to set up and used. It is designed to record your daily steps (walking and running), the distance you covered in kilometer or miles, calories and fats you burned and exercise time. Aside from this, 3DTriSport Supreme Quality Walking 3D Pedometer with Clip and Strap is equipped with Tri-Accelerometer (Tri-Axis) technology that accurately measures your steps. Stores up to 30 days of information. Not that easy to set up. Can be uncomfortable on waist for some people. Due to 3D Tri-Axis Sensor Technology, this pedometer can be worn around your neck, on your hip, belt, in a pocket, in your purse or bag. In addition, you can position it in any way, whether flat, vertically or horizontally and still expect for accurate results. 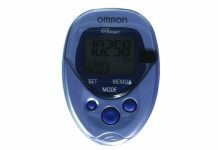 This 3D Tri-Axis Digital Pedometer is compact and lightweight, which makes it perfect for any outdoor activity. 3D TriSport Supreme Quality Walking 3D Pedometer With Clip and Strap also offers 30-day memory, so you can track your progress daily for a month. This makes it a great fitness tracking device, whether as a pedometer for walking or pedometer for running. Aside from this, the product comes with a 100% satisfaction guarantee with its 18-month warranty. Press MODE until “Min” is displayed at the top of the screen. 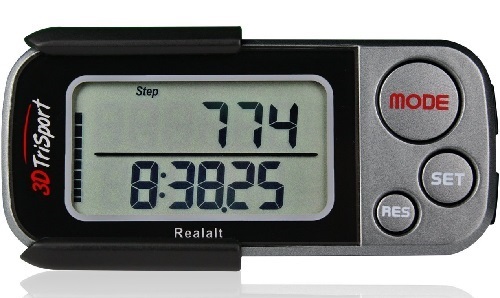 Press MODE until “Step” is once again displayed at the top of the screen and “Days Record” is displayed on the bottom-right of the screen. In Daily Memory mode, the top number represents data for the selected day. The bottom number represents the number of days before the current day. Press SET to browse and recall the selected day’s accumulated data for Step mode, Distance mode, Calories mode and Exercise Time mode. Press RES to browse through previous days’ data. Total Memory Mode – displays your total accumulated data for each function. In Total Memory mode, the top number represents your total accumulated data. 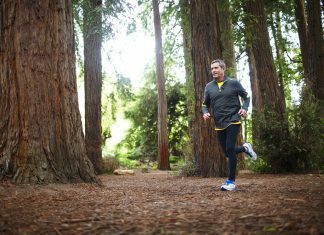 Press SET to browse and recall total accumulated data for Step mode, Distance mode, Calories mode and Exercise Time mode. Choose units of measurement: Choose “Cm” to program the pedometer to display all units of measurements as Metric/Kilometer/Kg/Cm or choose “In” to program the pedometer to display all units of measurements as Imperials/Miles/Lb/Inch units. 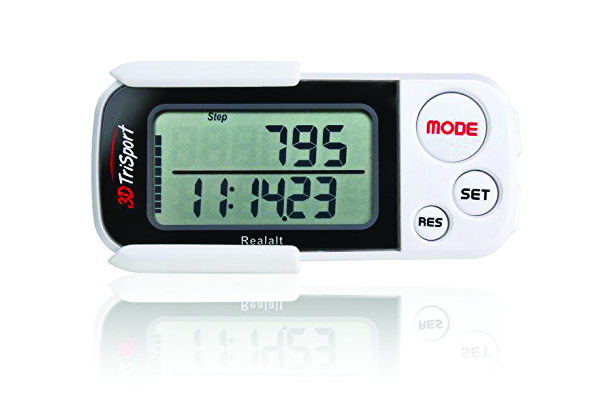 As mentioned 3DTriSPort Walking 3D Pedometer has an 18-month warranty that covers any defect of malfunction. Depending on Realalt’s discretion, they can replace any defective or malfunctioning parts, replace the device or refund the purchase price, free of any charge. Customers should take note that the 3DTriSport Walking 3D pedometer warranty does not cover general wear and tear, battery or any problem caused by misuse or abuse. In addition, consequential and incidental damages are not recoverable under this warranty. Customers who purchased 3DTriSport Walking 3D Pedometer are very happy and satisfied with their purchase. They were impressed with its simplicity, efficiency, and accuracy. Read some of the reviews below. “I gave the 3DTriSport pedometer a Five because I like its ease of use, large display, simplicity. It’s fun, and I enjoy keeping track of how much I walk since I got a little Maltese Terrier and I’m walking with her all the time. This is easily the best pedometer I’ve ever owned. Whereas other pedometers have to be positioned at the right spot on your belt and even then they can be quite inaccurate, this one just drops in your pocket and manages to accurately record each step. If you like clipping it to your belt, or place it in your bag that is an option, plus it comes with a security strap so it’s almost impossible to lose. Set up was very easy. 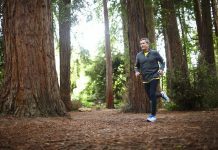 I simply can’t find any deficiencies in its function or its design and highly recommend this pedometer,” Tony, a verified buyer wrote about his experience with 3DTriSport 3D Digital Pedometer. “Having owned previously 3 pedometers and lost them I picked this one with trepidation but with the fact it has a lanyard and can put it around my neck. Delivery was with 36hrs at a time to suit,setting up was the easiest by far and so far the most accurate. Am extremely pleased with my purchase and can recommend,” Amazon Customer Richard wrote. If you want a simple and easy to set up pedometer that is reliable and accurate, look no further than 3DTriSport Supreme Quality Walking 3D Pedometer. Most customers who bought this fitness tracking device were very satisfied with their purchase that they even recommend this. 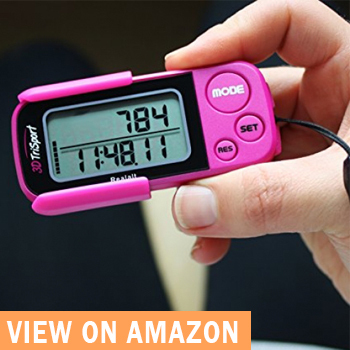 If you want this pedometer, you can get it here.